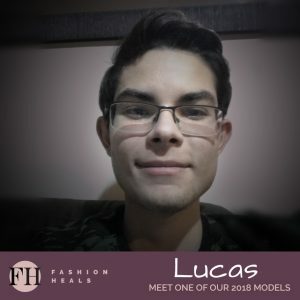 Former SickKids patient, Lucas is set to rock the official Toronto Fashion Week runway with Fashion Heals on February 7, 2018. Fashion Heals shines a spotlight on patients, families and healthcare providers with a mission to raise funds for The Innovation Grant for Paediatric Cancer Care and Research at SickKids. Donate today to make a contribution and join us for an evening of fashion and fun at the Spring 2018 Fashion Heals Runway Show to support inspiring people like Lucas. A natural athlete, from the age of four Lucas Aragao was rarely seen without a soccer ball at his feet. 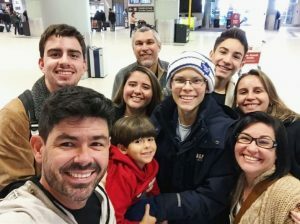 By the time Lucas’s family immigrated to Canada from Brazil, it was clear that nothing could slow down this bright soccer star. Lucas’s meteoritic rise to the top of the roster continued all through his high-school years. In early 2015, Lucas was 16 years-old and the top player on his high-school soccer team. It was during that fateful winter soccer season Lucas found it harder and harder to push through his exhaustion. It seemed that each time he was on the field giving his all, his eyes would cross, blurring his vision. Only after taking a break on the bench, his vision would return to normal. As the season progressed, Lucas’ symptoms continued to worsen. While Lucas continued to suffer, his soccer team pressed forward, earning a spot in the semi-finals. It was during the semi-final match that Lucas’ eyes crossed permanently, causing great concern to his family and teammates. Forgoing a victory, Lucas was rushed to a nearby hospital for treatment where he was told to return in six months if his vision did not improve. Unwilling to accept this diagnosis, Lucas’ parents headed straight for SickKids where Lucas was immediately admitted and received an MRI. SickKids was there to help Lucas get the treatment he so desperately needed at a time when others overlooked his symptoms. Following a week of continued tests, the oncology crew at SickKids diagnosed Lucas with Meduloblastoma, a form of cancer that causes a tumor to develop in the brain at the base of the scull. Meduloblastoma is one of the most common malignant brain tumors occurring in children and accounts for about 20% of all childhood brain tumors. Even though Lucas had a very good chance of recovery, he was not prepared for the intensive treatment of chemotherapy and radiotherapy he would need to receive over the next nine months. Lucas with his family at SickKids. All through these challenging times, the team at SickKids took incredible care of Lucas and his family. As soon as Lucas reached their doors, they were ready to help him get the treatment he needed. Throughout the treatment process, Lucas’ care team made every effort to ensure he received the best possible care and that the family was fully informed. Almost two years later, Lucas is cancer free. On April 6, 2015, Lucas received his last chemotherapy treatment. “I thought of it as an early birthday present for me because my birthday is April 8th,” said Lucas, the eternal optimist. We can not wait to see Lucas rock the runway on February 7th! Be sure to join us for an evening of fun, stories, and inspiration. Tickets are available here.